He wrote his diary in a secret code - an archaic form of shorthand known only to the most educated of his day. Because it was encoded, he was confident that no one would ever read his revealing portrait of the world he lived in. He was wrong. It took over 300 years, but in 1939 his code was cracked and the observations of William Byrd II became known to all. Because he never intended it to be read by others, his diary gives us an unvarnished view of life on a colonial plantation in the early 18th century. 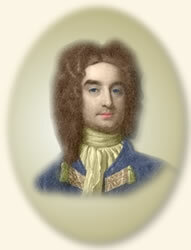 William Byrd II was born in Virginia in 1674 but was soon taken to England where he was educated. He remained there until his father's death in 1704. 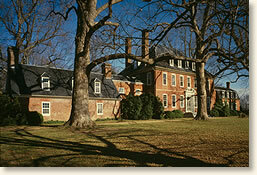 He returned to the colony and took over the management of Westover, the family plantation on the James River. He became an influential member of the Virginia aristocracy and was appointed to the colony's Council of State in 1708. He owned vast amounts of land (approximately 179,000 acres) and numerous plantations. He founded two cities - Richmond and Appomattox - on his land. He died in 1744. I rose at 5 o'clock this morning and read a chapter in Hebrew and 200 verses in Homer's Odyssey. I ate milk for breakfast. I said my prayers. Jenny and Eugene [two house slaves] were whipped. I danced my dance [physical exercises]. I read law in the morning and Italian in the afternoon. I ate tough chicken for dinner. The boat came from Appomattox [another plantation] and was cut in the evening I walked about the plantation. I said my prayers. I had good thoughts, good health, and good humor this day, thanks be to God Almighty. I was out of humor with my wife for trusting Anaka [a house slave] with rum to steal when she was so given to drinking, but it was soon over. My wife was indisposed again but not to much purpose. In the afternoon I beat Jenny [a house slave] for throwing water on the couch. My wife was much out of order and had frequent return of her pains. ...in the evening I took a walk about the plantation and when I returned I found my wife very bad. I sent for Mrs. Hamlin and my cousin Harrison about 9 o'clock and I said my prayers heartily for my wife's happy delivery...I went to bed about 10 o'clock and left the women full of expectation with my wife. About one o'clock this morning my wife was happily delivered of a son, thanks be to God Almighty. I was awake in a blink and rose and my cousin Harrison met me on the stairs and told me it was a boy. We drank some French wine and went to bed again and rose at 7 o'clock. I rose at 6 o'clock and said my prayers and ate milk for breakfast. Then I proceeded to Williamsburg, where I found all well. I went to the capitol where I sent for the wench to clean my room and when she came I kissed her and felt her, for which God forgive me. Then I went to see the President, whom I found indisposed in his ears. I dined with him on beef. Then we went to his house and played at piquet [a card game for two players] where Mr. Clayton came to us. We had much to do to get a bottle of French wine. About 10 o'clock I went to my lodgings. I had good health but wicked thoughts. God forgive me. It was very hot this day, and the first day of summer...my wife and I took a walk about the plantation; when we returned we found our son very sick of a fever and he began to break out terribly. We gave him some treacle water [a medicinal compound used as an antidote for poison]. My son was a little worse, which made me send for Mr. Anderson [the parish minister]. My express met him on the road and he came about 10 o'clock. He advised some oil of juniper which did some good. The child continued indisposed. In the evening we walked home and found Evie in great fever and to increase it [they] had given her milk. In the evening the children were a little better. I sent for my cousin Harrison to let Evie blood who was ill. When she came back she took about four ounces. We put on blisters and gave her a glister [an enema] which worked very well. Her blood was extremely thick, which is common in distemper of this constitution. About 12 o'clock she began to sweat of herself, which we prompted by tincture of saffron and sage and snakeroot. This made her sweat extremely, in which she continued little or more all night. Evie was much better, thank God Almighty, and lost her fever. The boy was likewise but was restless. Evie was better but the boy was worse, with a cold and fever for which we gave him a sweat which worked very well and continued all day. Evie took a purge which worked but a little and my son had a little fever. I went about 11 o'clock to Colonel Randolph's to visit him because he was sick...and took my leave about 5 o'clock and got home about 7 where I found the boy in his fever but Evie was better, thank God Almighty. The boy continued very ill of the fever. I rose a 6 o'clock and as soon as I came out news was brought that the child was very ill. We went out and found him just ready to die and he died about 8 o'clock in the morning. God gives and God takes away; blessed be the name of God. ...My wife was much afflicted but I submitted to His judgment better, not withstanding I was very sensible of my loss, but God's will be done. About 2 o'clock we went with the corpse to the churchyard and as soon as the service was begun it rained very hard so that we were forced to leave the parson and go into the church porch but Mr Anderson stayed till the service was finished. About 3 o'clock we went to dinner. The company stayed till the evening and then went away. Mr. Custis and I took a walk about the plantation. Two of the new negroes were taken sick and I gave each of them a vomit which worked well." Byrd's account is found in: Bryd, William The Secret Diary of William Bryd of Westover 1709-1712 (Louis Wright and Marion Tinling, eds) (1941). "Daily Life on a Colonial Plantation, 1709-11," EyeWitness to History, www.eyewitnesstohistory.com (2006).